This 45′ Custom Built Sportfisher is our Coast Guard certified Charleston fishing vessel that can carry 6 guests to 20 passengers. This Charleston Fishing Vessel is located on Shem Creek in Mt. Pleasant, she’s air-conditioned and heated, with a spacious open deck and bathroom. With a cruising speed of 20kts, you get to the fishing grounds in a hurry! 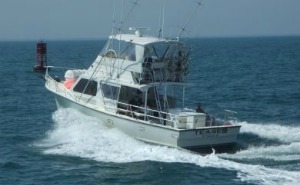 If you have over 6 guests to fish offshore, this is the only legal vessel to accommodate your group for Charleston fishing.